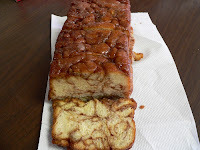 There are very, very few words that can do justice to the horrificly addictive properties of the cinnamon bread from Greenlee's Bakery in San Jose, California. It's so potent, that Mrs. Wise Cracker has banned herself from buying it ever again! OK, make that until swimsuit season's over. If you look closely at the photo (click the picture, I dare you!) you can see the veins of crack throughout the loaf. And I'm quite certain that the crack-infused glaze is just as deadly. If you live in the area and can get it fresh and warm from their bakery, check the corners for undercover narcotics agents... they'll be watching. If not, score it online or from one of their local dealers. It's worth absolutely every minute on the treadmill!